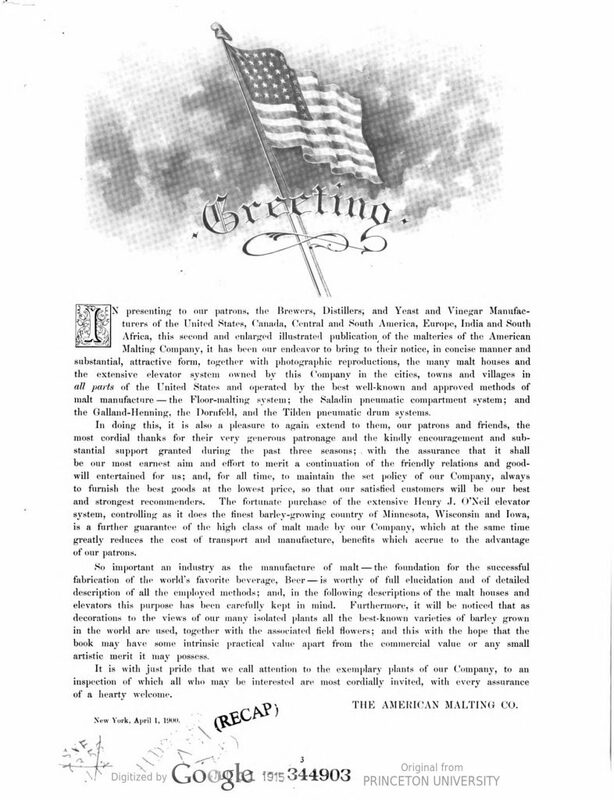 In North American industry into the mid-1900s, it was a practice to issue a commemorative volume of smart design, describing in measured prose on good paper, the achievements of the industry. Sometimes a corporate group issued this for its units, sometimes the industry as a whole was profiled. What was commemorated? Often a specific anniversary, but more generally the power and strength of the industry at a given time, critical mass in a word. I gave an example earlier where National Breweries Ltd. in Quebec issued such a volume in 1930 which described the history of its principal merged units. Earlier this week I discussed a 1907 paean to Rochester, NY’s beer industry issued in the looming shadow of Prohibition. Here is another example: an éloge to the American malting industry at turn of the 19th century. It’s called simply American Malting Co. The corporation of that name had 38 plants across the country and also an extensive grain elevator system. The business must have been built through many acquisitions as the individual names of the plants are mentioned to show the original, separate owners. (Could British capital have been behind a packaging and flotation of these industries or was it a home-grown example of consolidation and “raiding”?). The 38 maltings were concentrated in or around Chicago, Milwaukee, and Syracuse, NY. Most of the elevators were, quite naturally, in Minnesota. The Chicago locus for malting was no surprise either given it was a railway hub, had access to the Great Lakes, and was within striking distance of the American granary. In addition, as we have seen, the Windy City was not just an American but a world centre for scientific brewing studies, a key member of the Copenhagen-Munich-Burton-Brussels axis. (The true origins of the moniker Windy City may now be gleaned…). It is too easy, when considering the subject of beer from different angles, to forget the malt. Malt is the soul of beer, as old German hands had it. The British knew this too. Reading Taft-era American technological literature, which indeed represented scientific consensus, you can be forgiven for thinking corn, rice, and sugar had become indispensable materials and all-malt was old-fashioned. In a time when some brewers were pushing the upper limit of Wahl & Henius’s 10-50% range for cereal adjuncts in beer, some drinkers may have been forgiven for exclaiming, “Where’s the malt”? Although not phrased in such terms (my take-off on the famous Wendy’s hamburger promotion), that tag-line might serve neatly to describe the impetus behind the reformation of the American beer palate starting about 1975, something which spread to Canada and ultimately around the world. At least the American malting industry before WW I knew the power and importance of its product, one indeed provided not just to brewers but distillers and bakers amongst others. American Malting Co. describes a national network of plants, many shown in handsome black and white photographs. I’d think some of the enormous structures still stand given their enormous solidity to hold many tons of wet grain. We have an example right here in Toronto, pictured. The book explains that most of the barley used in American brewing was “Scotch 6 row” (Scotch? That’s a new one to me). There was some Chevalier 2 row as well, as we know from other sources, but it wasn’t significant in the big picture. There was also “Bay barley”, a term which encompassed a number of varieties and whose history is a subject unto itself. In brief, it seems the Spanish brought it to Mexico and California. Before Spain, it may have been native to Morocco. It was a 4 row type, like 2 row due to a similar protein content to that barley, but with a thicker husk and rendering less extract. The British used it as an adjunct in their barley blends for malting in the U.K.
A last chapter explains contemporary malting methods. There were five types, all still recognizable today, with three main categories: traditional floor malting; Saladin box or compartment; and pneumatic drum. This modern explanation from Don Valley Engineering (the British Don Valley, not ours) gives a good overview of these methods as modernized today. Malting has achieved some attention in modern consumer writing on beer and brewing. A modest micro-malting industry has been noticed, a natural complement to craft brewing as local hop fields are. In general though, a workhorse of the brewing world doesn’t get the respect it deserves. Let’s fix that. 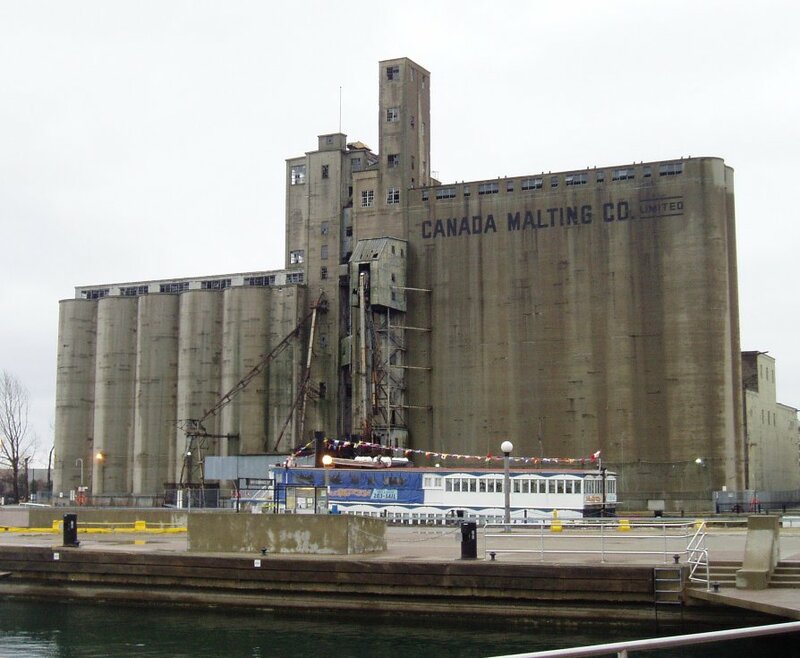 Note re images: the first image was sourced from the volume referenced in the text at HathiTrust and the second, from the Wikipedia entry on the historic Canada Malting silos in Toronto, here. Attribution of the latter image is as follows: By SimonP (Own work) [CC BY-SA 3.0 (http://creativecommons.org/licenses/by-sa/3.0) or GFDL (http://www.gnu.org/copyleft/fdl.html)], via Wikimedia Commons. All trade marks and other intellectual property in such images belong to their lawful owners or authorized users. Images are believed available for educational and historical purposes. All feedback welcomed.